Right now on a good many music tech blogs and forums there is palpable excitement around the future of mobile music-making and the cause of this is a new way of understanding how the space can evolve, courtesy of an app called Audiobus. This new app isn’t a tool for making music in its own right but actually an innovative means to connect apps which are within Apple’s iOS ecosystem. For instance, a drum machine such as Funkbox and a synth such as Sunrizer can be routed through guitar FX apps and recorded in studio apps like Multitrack DAW. 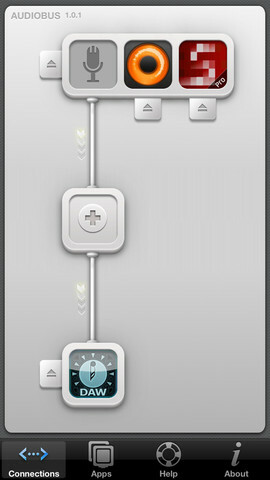 In addition to this, the basic controls of other connected apps, such as play and record are available via a handy sidebar which removes the need to keep constantly switching. Less than a year ago I was discussing the possibilities of such a tool with one of its creators, Sebastian Dittman of Audanika (SoundPrism) who, alongside developer Michael Tyson (Loopy) has brought the app to fruition. Back then, Sebastian was challenging the isolated and self-contained nature of iOS apps – something that doesn’t exist in normal music tech where instrument and FX apps from different vendors run smoothly inside workstations such as ProTools and Cubase – and believed, quite rightly that this restrictive setup really shouldn’t be the reality. Much as was the case with Virtual MIDI, which allowed iOS music apps to sync up and control each other, a spirit of co-operation between the team behind Audiobus and various developers who have signed up to incorporate it in their future releases has proven that this isolated nature of iOS app can soon be a thing of the past. What’s even more encouraging is that Apple approved this external development within their ecosystem, a good thing too when you consider the value it adds to iOS devices themselves as music making tools, as well as vastly extending the creative possibilities of the apps themselves. Whether Apple goes one further and incorporate Audiobus within its own Garageband app remains to be seen, but I for one hope that it will. 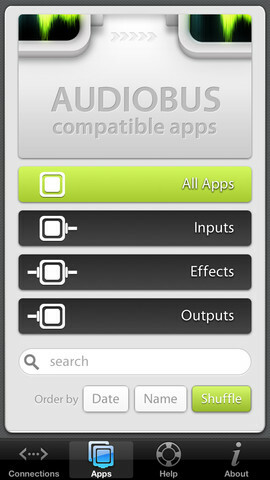 Audiobus has launched today with support for several popular iOS apps and the promise of many more to follow. If it does indeed become the standard it promises to be then it opens up a huge range of creative options for mobile music makers looking to mix and match the ever-growing selection of synths, FX and DAW/Sequencer apps already available on their iOS devices.